The composition of natural water bodies depends on gain and loss of solutes through both chemical reactions and physical processes. For the most part, solutes undergo a geological cycle in which materials entering solution as products of weathering reactions of rocks, volcanism, and so on are carried to the oceans where they undergo further reaction, are deposited in sediments, and eventually are reincorporated into new rocks, which may repeat the cycle. Obviously, these processes have a long time scale. Volatile materials may enter the atmosphere for part of the cycle, and some elements may take part in biochemical as well as geochemical processes as described in Chapter 10. Physical transport of particulate material suspended in waters and as dust and sea spray in the atmosphere also has a part in these processes. The composition of the ocean is not uniform, but variations from average values generally are not great. Dilution from freshwater sources is one means by which total concentrations can be altered locally. 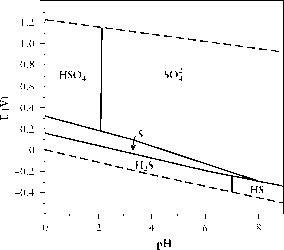 Relative concentrations of the dissolved materials are not changed by this, but they can be altered in regions of major chemical activity such as ocean vent systems. Fresh waters show much greater variation. Table 11-1 compares ocean and average river water compositions for some nonvolatile solute components. Oceans receive solutes from rivers, but the composition of the ocean is not simply that of a concentrated river. A major difference is in the Na/K ratios due to selective incorporation of K+ in sediments. The natural freshwater sources of the materials in solution are chiefly weathering reactions of minerals. The most important reactions involve decomposition to other insoluble mineral species, with some decomposition products such as metallic cations entering solution; examples are given in Section 12.3. "See S. M. Libes, An Introduction to Marine Biogeochemistry, Wiley, New York, 1992, p. 683, for a more complete list. California,1 approximate this situation. For most fresh waters, carbonate species are the predominant anions. Magnesium salts and silicates may also be among the precipitates, but F~, CP, and most SO^ ions stay in solution as Na+ and K+ salts until late in the evaporation process.